To-night was a "me' night. We had homemade carrot soup for dinner, and after watching some of the news, I headed for my exercise bike. after 30 minutes on the bike,I did a few weights, some yoga, and took a bath. 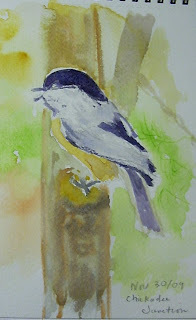 I finally felt sufficiently relaxed to try a little sketch of a chickadee. I've been wanting to try drawing them for sometime, but I've never done animals or birds before, so I was nervous. I am also not in complete command of watercolors. I do not want to ge tcaught in that 'need to produce a perfect picture cycle' which is why I am thinking of it as a sketch (it truly is though, as it is nowhere near a finished piece). I have to start somewhere though, and so here it is. I am tossing it out there. You can see that I am a novice, and it is quite crude, but I have gathered my courage, and I hope they'll be more. It's the end of a nice..
weekend. It was a rainy day yesterday which I don't mind because then I don't feel guilty about staying in all day. I cooked--turkey chili, polenta, and carrot/turnip soup. I spent some time in my sewing room, and a friend dropped over for a show and tell and some advice on a piece she is working on. Last night my husband and I watched Angels and Demons with Tom Hanks. 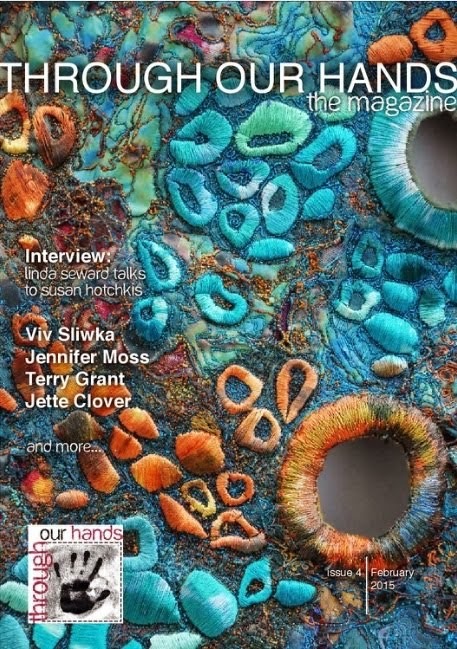 I enjoyed it and did lots of knitting on an afghan at the same time. Today it was not raining but very windy, so we walked the trail which is sheltered from the wind. We went to visit the in laws for a bit, and then I still had about an hour to spend in my room. 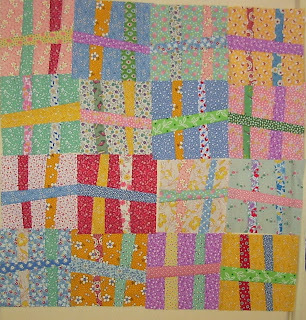 I've finished all the blocks for my baby quilt - you can see them tacked onto my design wall. I thought they sort of looked like wonky H's, but another blogger -Exuberant Color- wrote that they remind her of fences and I think they do. 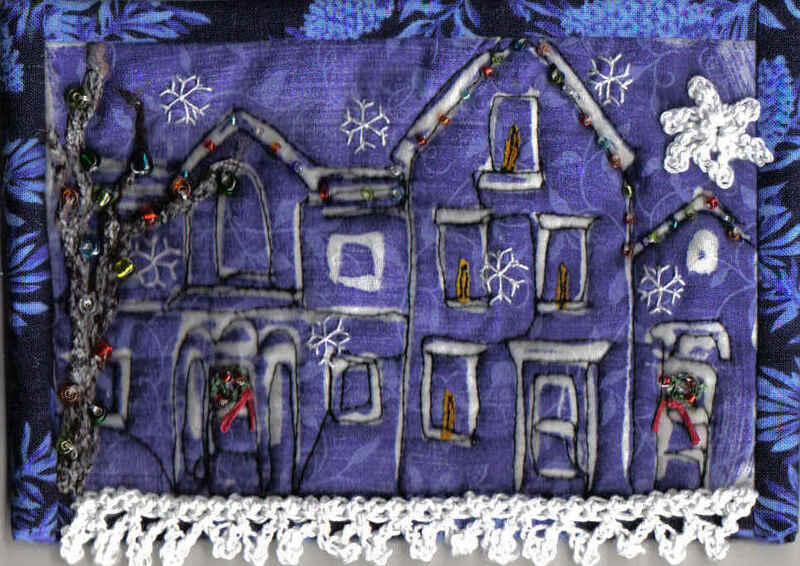 I'm still working away at the bits and pieces for my little winter wall hanging. I laid out some wool roving and threads onto netting and then free motion stitched it all with water soluble stabilizer on top. Here is the finished piece. It looks darker than it really is. I have really got to improve my photography skills! 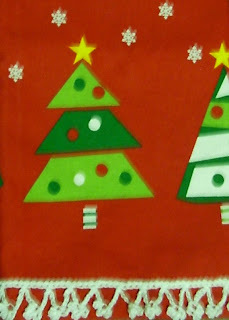 Here it is cut into strips and sewn onto the hanging. 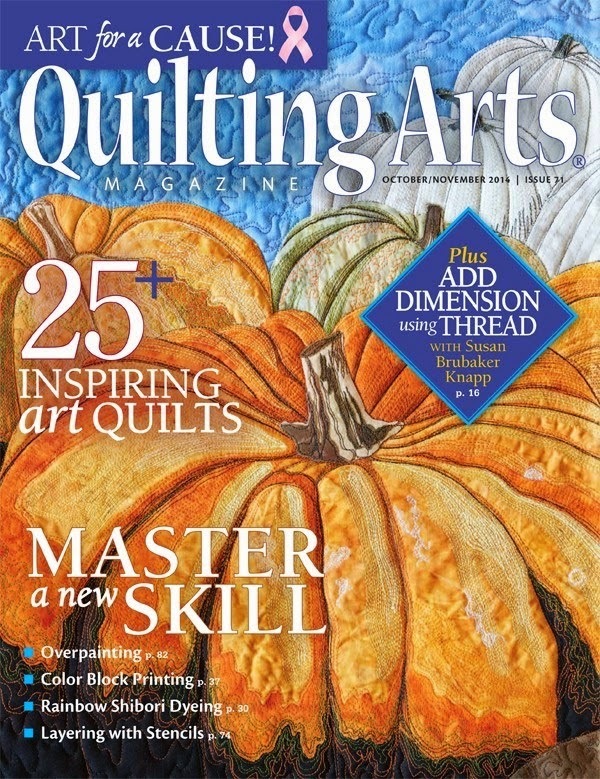 Also, I added a tree that I made from wool fibers and a free motion zigzag. The last photo is of another tea towel onto which I sewed a line of crocheted trim. Again, I tried this photo several times and I finally gave up on getting the trim in focus. I tried both the regular setting and the macro setting for closer objects. You get the idea anyway. I'm heading out to the kitchen now to make a salad for my lunch tomorrow. I just came in from a walk with my husband, and I'm going to put my pj's on soon to watch Survivor. That's the thing about a blog I'm discovering. If you want to tell about your day and your life, you have to be honest. I'm not much of a TV watcher-- after supper - news, and I usually watch an hour from 9-10. So to-night I'm confessing again to watching a television show as if I should feel ashamed. It's one of the few shows that my husband and I watch together. That's a good thing isn't it? 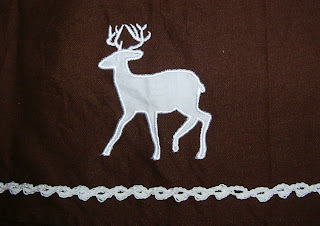 So, no sewing to-night but I do have a picture of another trim that I did last night for a tea towel. The pattern came from Linda Permann's book, Crochet Adorned, which I have written about in an earlier blog. 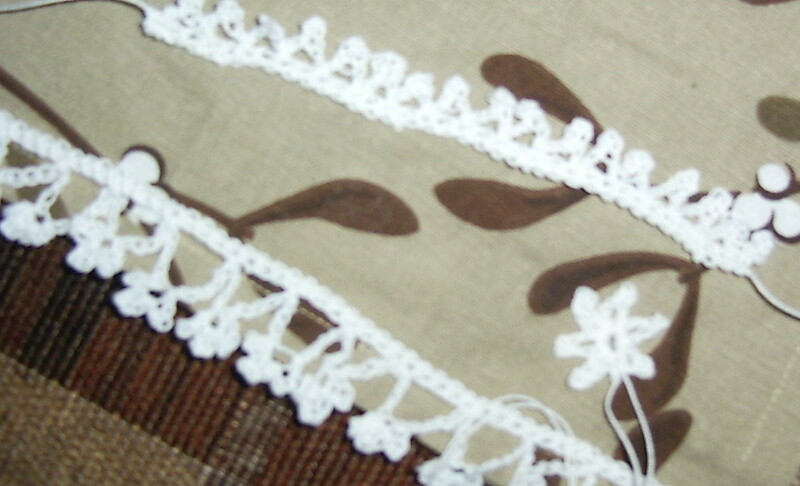 I think I will also do a few little snowflakes to go with it. 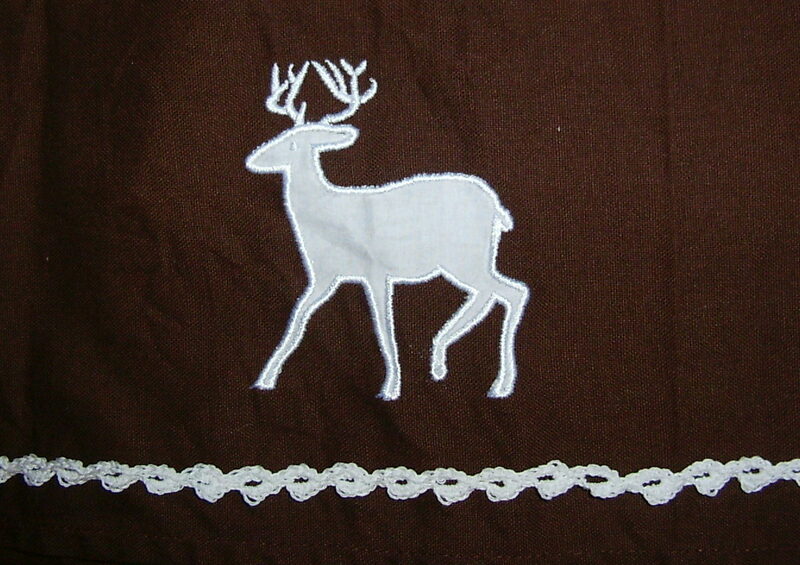 The deer was already on the towel. I had a frantically busy day at work today. There were piles of correcting, the phone was ringing, the email was ringing, and I had an assessment to do, at the same time as I helped my students. I really needed the yoga to-night! 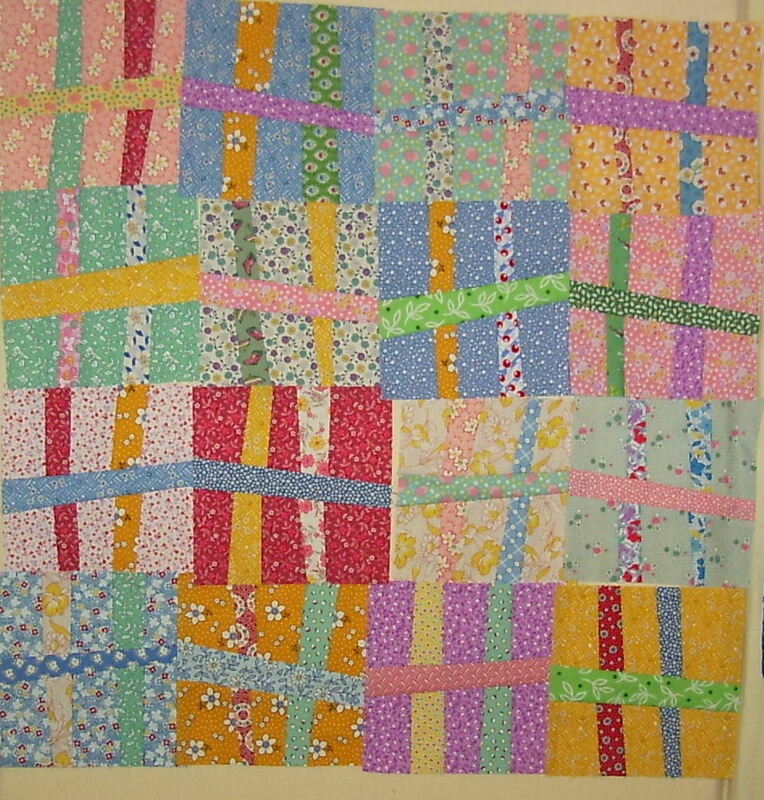 After a quick supper I came straight to my sewing room and did 2 more blocks for my baby quilt. As you can see below, I now have 16 blocks, randomly arranged on my wall. I want to do 4 more for another row. I was at first inspired by a pattern I saw on the net, but then discovered it was called Cross Blocks. I decided to add a second strip, and then when I turned it I discovered the little up and down motion in the horizontal strip which I really like. No more sewing now; I must go pack something for my lunch, change into PJ's and get out my knitting to relax and watch TV for an hour. I will confess that I like the show NCIS. It's horribly corny, and I don't like the gory detail, but for some reason I've grown attached to the characters. That's what the producers wish for I guess. I didn't get near a needle, thread or sketchbook yet today, but it was a satisfying day nonetheless. This morning I put 2 loads of clothes on the line; soon it will be too cold on most days. I'm stubborn though- I insist on hanging out my sheets all winter even if I have to wrestle them stiff like boards off the line and put them into the drier for 20 minutes. I spent a of couple hours in the kitchen making cookies which I haven't done in ages. I also made a spinach pate which is now baking. We will have it with the salmon steaks that my husband is going do on the barbecue. 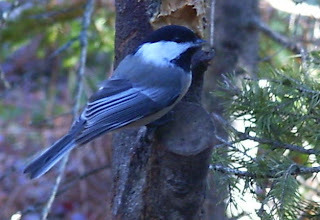 After lunch I went for a walk with a friend on a woodsy trail to a place called Chickadee Junction. There is a bench there and lots of feeders which are kept refilled by people who walk. I took a couple of pictures to add to my blog, especially for a friend who is spending time in the city to help her mother. She commented that she misses watching the chickadees in her backyard. I have not done a sketch of them yet. I just the gray jays (sometimes called gray jays) too. All in all I had a pretty good Saturday considering that it didn't start out that way. I woke up around 6 am after a restless night. It was partly due to the H1N1 shot that I got last night--I got the one with the adjutant(sp?) -- which apparently can make your arm sore, and it did. Then I also am still trying to get back to my normal dose of cortisone, so I'm feeling withdrawal from that. One of the symptoms that one can have is mood swings, and I was definitely down this morning. It ended up being not such a bad thing though to be up early. I made an apple crisp, did my bed linens and hung them out. Then I made myself a lunch and went off to my local guild's UFO day. The happy buzz from all the ladies always puts me in a better mood. I stayed until after lunch, then did a few errands, and came home to make supper. I even spent a little time doing some garden clean up. 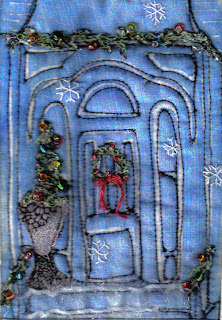 The picture is of another stamped piece like the Christmas postcard. I did them both from a stamp that I made from fun foam. 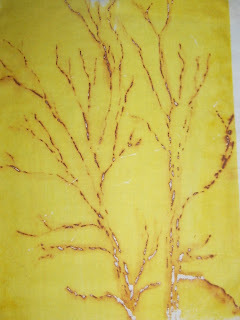 I drew into the foam and printed it onto fabric with fabric paint. 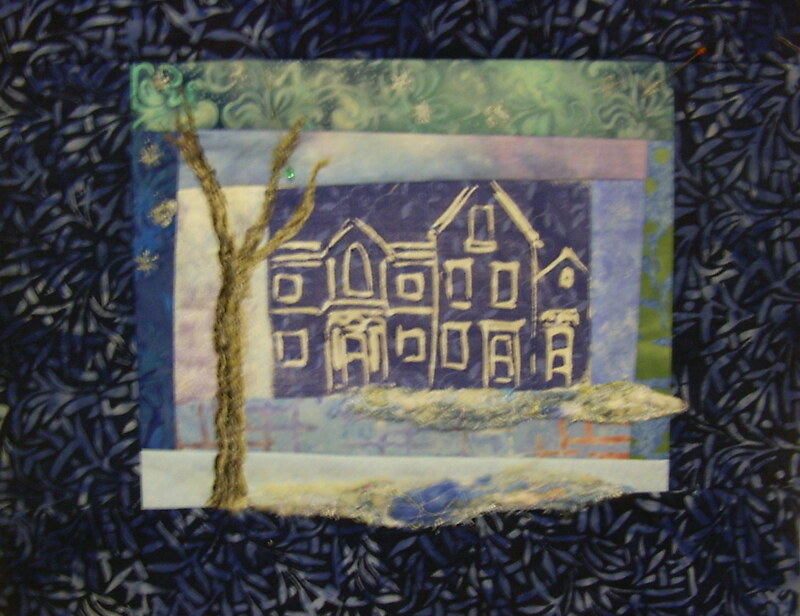 This time I'm making a small art quilt that I will embellish and quilt, but in a snowy theme, not a Christmas theme. It's a liitle crooked--it's the photographer. If you're interested in beautiful dyed fabrics and other accessories, check out the blog called Candied Fabrics at the address below. She has a new website, a new look for her blog, and an amazing giveaway if you're interested. I love her little birdie designs and I also love her new Artful Houses! Little snippets of time here and there is what it's all about when you work full time. I don't always have the time to get to my studio, and sometimes I have the time but no energy. To-night was our yoga night though, so we had supper at 7pm. The I spent a half hour talking to my daughter who is probably having her busiest week of her 4 yrs of university. All her midterms and projects are due this week, and just when I talked her through all the panic and she seems to be getting prepared, her apartment gets flooded in the heavy rain on Sunday. she had planned to go to the library to work all day, but spent it instead mopping her floor. Finally the plumber came Sunday night to help. They took off the toilet and cleared the drain and yesterday the cleaners went in. On top of that she has a bad cold. She spent all day today at the library studying for the 1st midterm tomorrow. This is all my roundabout way of saying that life just gets in the way of creating sometimes, and I like to try to relax about that and take my time when I can. If I'm too tired to sketch or do anything creative, I might put a few seams together, and maybe post my blog. Sometimes, like to-night, I just happen to have something that I finished yesterday to post. Here is a photo of another little Christmas postcard. 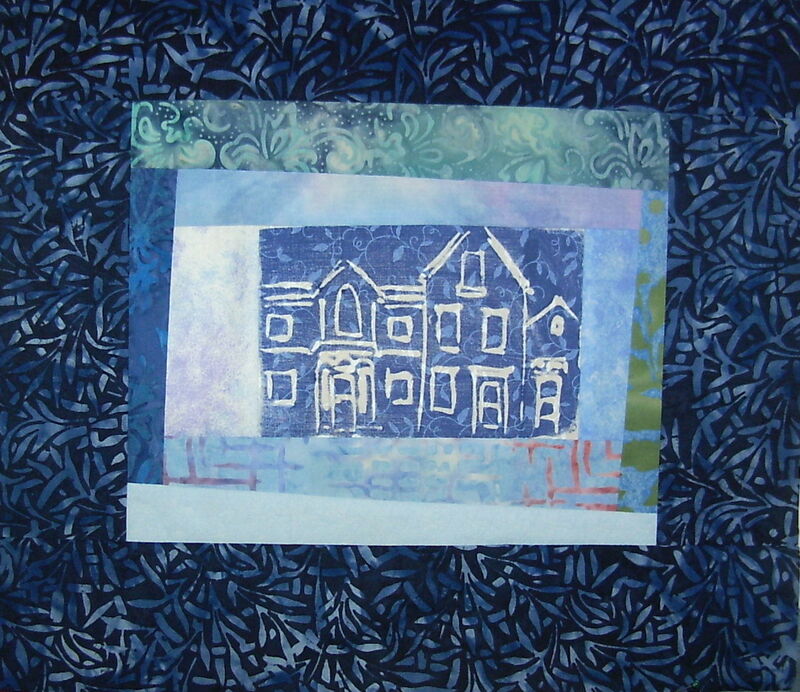 It is based on a stamp that I made after visiting my son last year in Lunenburg, NS. I call it Christmas in the neighbourhood. It's a Monday night so I don't have a lot of energy to-night. Also, I started training a new teacher today who will be working with me. We hope to be moved into our new and bigger room by next week and to have taken another 8 students. I came straight home from work, and my husband and I went out for a walk before dinner. It gets dark before 5:30 now so if we want any sun at all we head out after 4"30 when we get home. 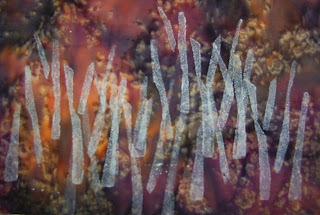 Shortly I'm going to have a nice soak and then perhaps have a little time in my studio. In the mean time these are pictures form some things I worked on yesterday. The first are some edgings (one is on a tea towel) that I did inspired by a book I wrote about in an earlier blog post. I'll be doing some for small gifts for Christmas. The next photo is of some blocks that I started for a baby quilt. I have a niece who is expecting after Christmas. I think the repro fabric makes such a nice baby quilt. The layout of the blocks will likely change one I have more done. It's a beautiful November day today. 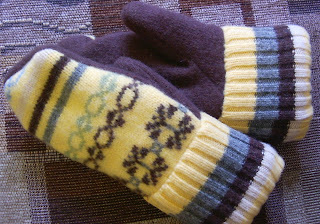 I got up early and visited our local market today where I bought a pair of mitts made from recycled and felted wool sweaters. 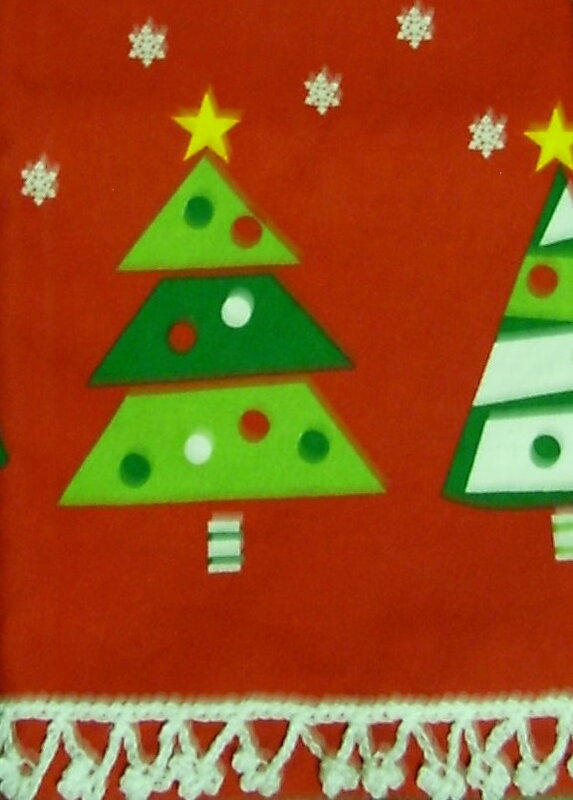 They are lined with fleece, and I think they will be perfect for walking, skiing or snow shoeing in the winter. Then my husband and I went to Daley Point, a local bird sanctuary, for a walk. 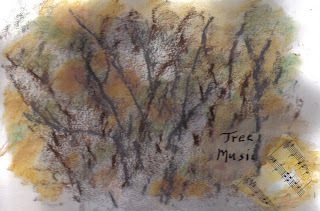 We took lots of pictures, and it was even warm enough for me to do a little watercolor sketch. I got a little chilled toward the end as it I was near the water, so I finished it up at home. Before I left,I had chopped eggplant and zuchinni for a ratatouille, so that when I got home, I could put it on the stove to cook with a can of tomatoes, some peppers, mushrooms and spices. Now that supper's simmering, I can spend some time in my studio. At Daley Point I took pictures of birch trees along the trail as we walked, so that I'll have them for reference as I work on my textured background from my last blog. Aren't these berries pretty? One blog that I read said that they would not usually post an unfinished project. For me it is all about the unfinished project and the process I go through when I'm creating. I start with an idea in my head, and sometimes a vague sketch. I think I know how I'm going to get there, but in the process I often find something doesn't' work the way I thought it would and I try something else. this is where the "what if?" comes in. So last week, I received a package put together for me form the Laurie swim workshop that I had to miss. 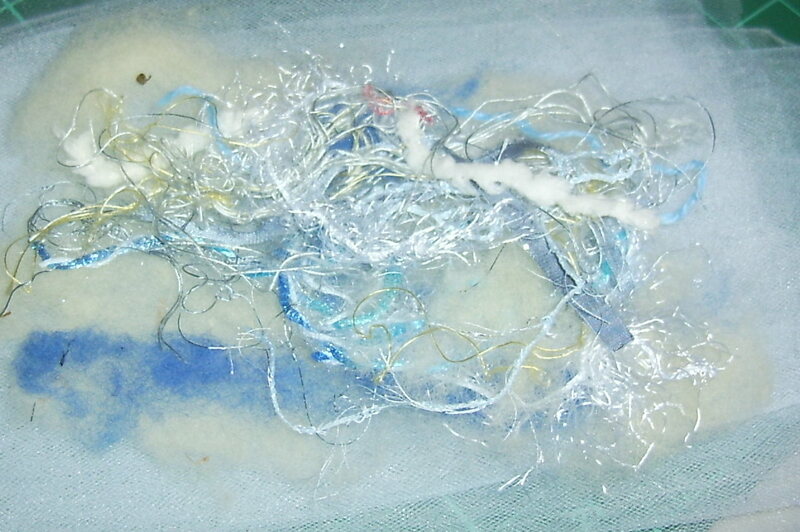 There was a sample of free motion stitched bits of ribbon, yarn, and scraps of fabric. this afternoon I started playing around with it. first of all I did free moti0n stitch my own, and it is hanging to dry right now. Then I started playing with some ideas. 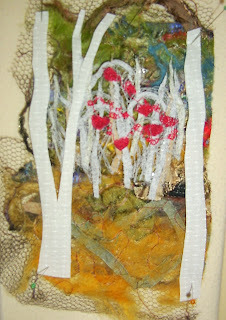 First I tried some needle lace with little strips of fabric to look like trees. When I put it on though, I didn't like it. 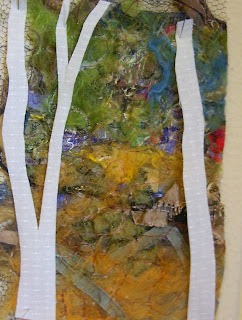 Then I decided to use just one birch tree--it's plain as yet-- I will thread paint it, and I also went back and re- cut the tree, only taller so it would run off the fabric. 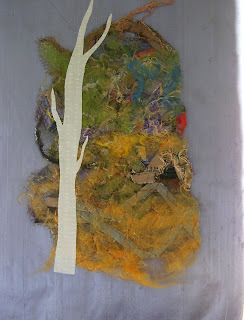 At that point I decided it needed a background, so I cut a piece of grey Dupioni silk. Now I'm gettting somewhere. I have to go now and get ready for work tomorrow, but at least now I think I know what I will do next. I feel like I just wrote that it was yoga night, and another whole week has passed! I've been trying to follow Deepak Choprah's advice and try to 'be' in the moment. It really does help me stay more relaxed and focused on what I'm doing at the time, but I do still feel that time is just going too quickly. I've been working on some little blocks for a baby quilt; however, I can't seem to make up my mind on the direction yet, so I'll wait to post pictures. 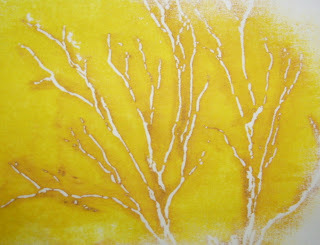 I did do some more screeen printed trees--Sorry, I'm nowhere near quiting on the tree theme yet. I just keep thinking of more things to try. I think once I'm all 'treed out', I'll put it all away for a bit, and sometime after Christmas I'll start thinking about putting something together. 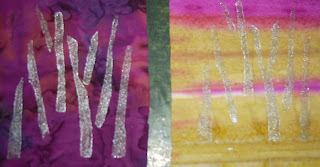 Then, I made a stamp on corrugated cardboard with strips of window insulation. I quite like the silvery ones. I can't believe I haven't posted since Tuesday! It's been a busy week. Wed. night I had to sit in on interviews for a new teacher we are hiring who will be working with me when we expand into a bigger room. I also always feel the need to get out for some exercise, so that took up my other nights. Yesterday, I volunteered at the Bay Breeze Art Gallery where I have some of my work. 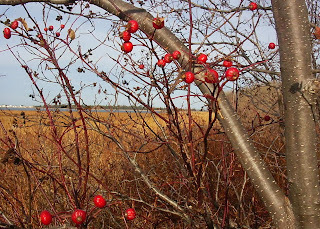 It was such a beautiful day, --although cold--that when I got home I went for a walk down the NB Trail. I took a few pictures for future reference in my artwork. Here's one of some moss and mountain ash berries. 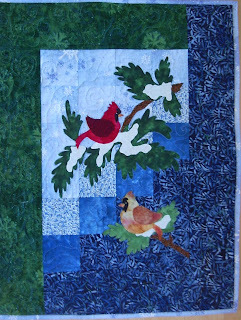 I did manage to get the binding sewn onto my little cardinal wall hanging, so I can put it away until it's time to mail it for Christmas. The color is good, but I cut the binding off on one side when It took the picture. Last night I started cutting a few squares for a baby quilt that I want to do for a niece. I noticed this block one time on the internet and I drew it out. When I went looking again this week it was called Crossed Blocks. I hadn't really thought of it in a religious way when I started it, I just liked the graphic simplicity of it, so I've decided to continue. I'm hoping once I add in all the different Repro prints it will be 'prettier'. After I post this, I'm going outside to tie up my last few trees, help my husband with a couple of chores, hopefully before it rains, and then after lunch we will visit the in laws. To-night was our yoga night. we came home, had a quick lettuce, tomato, humus and goat cheese sandwich, and then I took a bath. I just want to post a couple of pictures before I go sit down with my knitting. 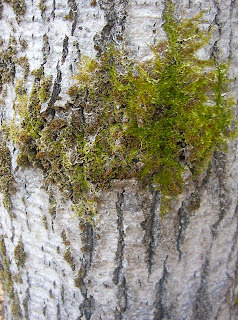 You'll probably be gagging because there are more trees. 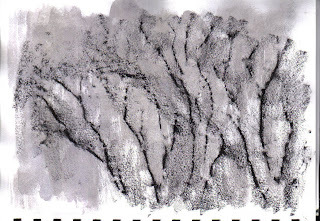 I took my sketchbook to work with me today to scan my latest rubbings with watercolors. I am still totally fascinated by all the possibilities. 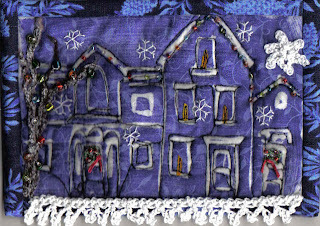 The last photo is of one of my Christmas fabric postcards. what do you think? I'm going to try printing some cards with it. Today, I felt better, and I actually got quite a bit done even though it felt like a very relaxing day. It started out quite early because of the time change. The story really started last night around 10 pm or so when a rain squall hit and knocked out our power. I was trying to read for as long as I could since I knew I'd have the extra hour this morning. I did read for a little while with my clip- on book light. I believe I woke up around 6:30 which of course was actually 5:30, so I made a cup of tea and read some more. I'll be adding my present reading to my book list. I'm really enjoying the book The Story of Edgar Sawtelle by David Wroblewski. It is an Oprah book and just as the reviews on the back state, you are drawn immediately into the prose. I've been waiting for weeks to have a chance to try my silkscreen out. 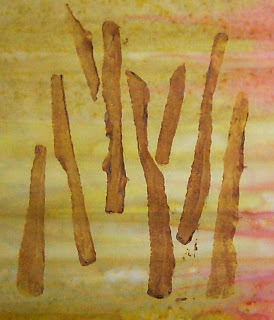 I used a brown Neocolor II crayon and rubbed a relief onto the screen. 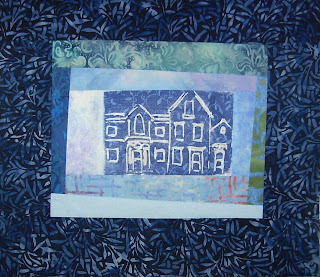 Then I did several 'pulls' or prints. 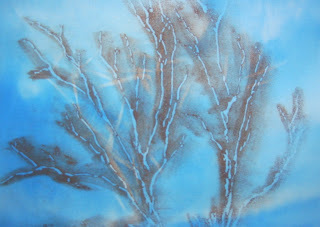 The first I did with plain acrylic medium onto a blue sun print background. 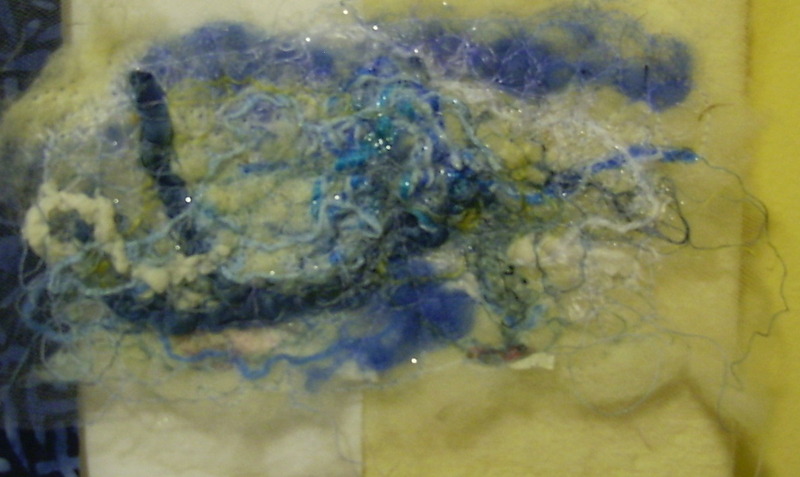 I'm not sure if I really like it-- it reminds me of seaweed--, but I may find a use for it someday. 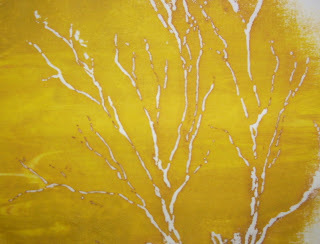 I did 4 more pulls using the acrylic medium mixed with a gold colored paint. The first couple are not too bad; however, the last 2 (not shown) have some areas that didn't print well. Fortunately they were on the outside edges, so I'll be able to trim them. My husband and I also took a short walk on the NB trail around lunch time, and I snapped a few pictures for future inspiration. 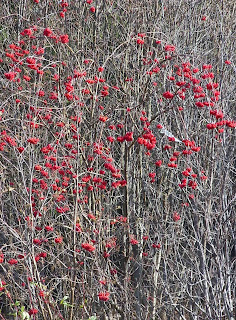 The following is one I took of some Mountain Ash berries. 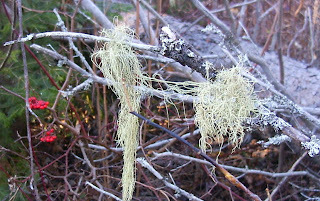 Don't you love tree moss?